New Oxford won for the fourth time in its last five games as the Colonials downed visiting Red Lion, 56-49, in YAIAA Division I boys' basketball action Friday night. The Colonials led by as many as 16 points in a fourth quarter in which the young Lions never quit, but never got closer than seven points, either. "We're a young group. This is basically next year's team playing this year," Red Lion coach Steve Schmehl said. "We battled tonight and we made it a game in the fourth quarter and I'm proud of our guys for hanging in there." New Oxford's victory completed a three-game week that closed on a high note with two straight victories after Tuesday's loss to Central York. "It's nice to win on back-to-back nights," New Oxford coach Sean Bair said. "It can be hard to get up after playing well the night before." 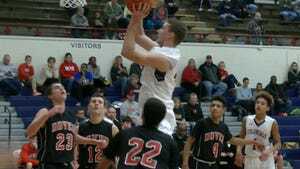 New Oxford (7-4, 3-3) defeated Dover on Thursday, 76-48. Red Lion (1-8, 0-6) trailed by seven after one quarter, but scored the first seven points of the second quarter to narrow the gap to 17-16. A 12-4 spurt by the hosts gave the Colonials a nine-point lead at the half. New Oxford made 10-of-26 shots from beyond the arc. Schmehl lamented that it's hard to defend against a team that has five shooters on the floor. "They're tough with all of their shooters," Schmehl said. "They run a lot of good stuff when you play man against them, so we went with zone and we were a little slow on our rotations and gave them too many open looks." Jamel Foster paced Red Lion with a game-high 21 points and pulled down five rebounds. "Foster is a really nice player," Bair said. "They have some nice players, but he stands out, in particular. He does a lot of things well." Jordin Brown led New Oxford with 18 points, while John Wessel tossed in 14. Each of them pulled down seven boards.